If you want to remember the Order of Planets, it is easy to remember a rhyme such as "My Very Easy Method Just Simply Uses Nine Planets" This gives you the initial letters of the nine planets of the solar system in order. There is now evidence that either Pluto is too small to be a planet or that there are hundreds of other small planets the same size as Pluto further out in space so the list of planets could get longer. In fact we now know there are countless numbers of planets around other stars, but thankfully nobody asks us to remember the names of planets outside our solar system. The earth is orbiting around the sun at about 90 miles per second. Mercury, the first planet is a tiny ball, not that much larger than our moon. Saturn, the biggest planet is more than ten times larger than the Earth. In the Summer of 2006 The The International Astronomical Union (IAU) finally settled the question of whether Pluto, which was first spotted in 1930 is really a planet or just an asteroid. Pluto is very small and there are bigger objects (such as 2003 UB313 - nicknamed Xena - discovered by by Professor Mike Brown of the California Institute of Technology) out in our solar system. The IAU ruled that Pluto is not a planet because it has not 'cleared the neighbourhood around its orbit.' which means it has not got enough gravity to attract all the asteroids in the area to itself. Can we see the planets from Earth? Yes we can see the planets. The two closest planets, Venus and Mars can be often easily seen with the naked eye. For the others a pair of binoculars or telescope is needed. Telescopes help you see things that are far away in lots of detail. 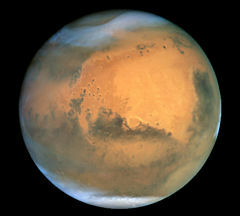 When the planet Mars is viewed with the naked eye it is just a red dot in the sky. Using a big telescope like the Hubble Telescope (which is actually on a satellite in orbit around the earth) we can see some amazing detail of the red planet. 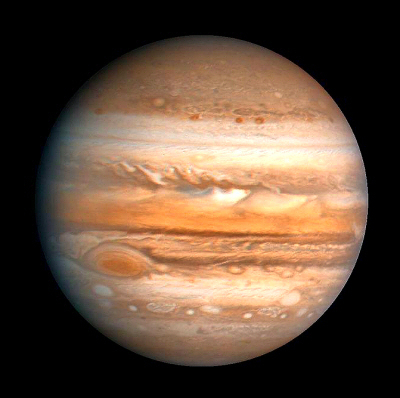 Here is a photograph of the gas giant Jupiter. It was taken from the NASA Voyager spacecraft as it flew by the planet in 1979. Are there any other planets? Yes there are definitely many more planets out there. Scientists have already discovered more than 50 planets in other Solar Systems but you would need a really big telescope to see them clearly. The first planet outside our own solar system was discovered to be orbiting the star Gamma Cephei, which is 45 light years (270,000,000,000,000 miles) away. There are probably millions upon billions of planets in the universe which leads to the question is there life on other planets?.